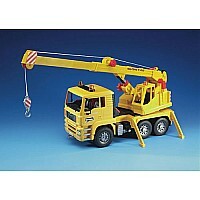 Kids will reach new heights with this functioning crane truck! Pop on the stabilizing legs that store in the back and crank out the crane to move heavy loads and reach the tallest points, or tilt the truck cab forward to reveal a detailed engine. 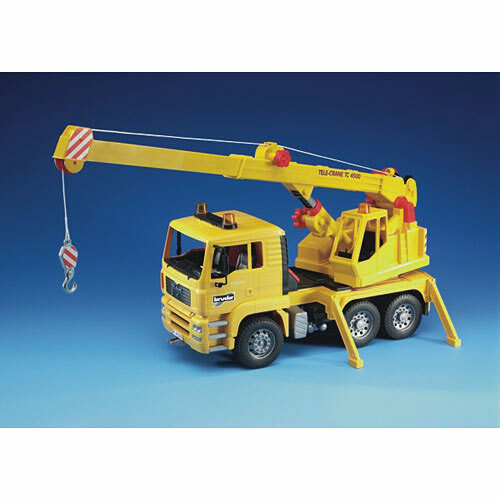 The telescopic and height-adjustable crane unit swivels 360° and features a locking mechanism for the hook. Other features include rubber-like wheels and a toolbox that opens and closes. Measures approximately: 16.70 x 6.90 x 9.50 inches..